Japanese knotweed is the UK’s most hated and feared plant. It’s also derided much further afield, affecting large parts of the USA and Europe. As well as wrecking buildings and infrastructure, with often horrendous financial results, it’s choking waterways, damaging flood defences and ruining beautiful, unique and precious natural habitats. It has found its way to remote New Zealand and Australia and it is even volcano-resistant, growing happily in still-smoking volcanic ash. Philipp von Siebold, the nineteenth century botanist who originally acquired a specimen of Japanese knotweed in the 1840s and whose horticultural firm decided it was a good idea to sell cuttings, would probably be horrified by the havoc his find has caused. At the time it was an instant hit with keen gardeners, loved for its majestic size, beautiful leaves and delicate flowers as well as its extraordinary vigour. By 1898 it was being recognised as a problem and by the 1930s it had acquired a sinister nickname: Hancock’s Curse. 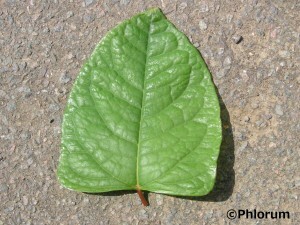 “outside its native range, knotweed has the biodiversity value of concrete. Nothing lives on it, nothing eats it”. It’s clear the issue is getting worse, well on its way to becoming one of the globe’s knottiest invasive species problems. So what are the latest developments in the battle against this ferociously successful weed? Will psyllids deliver a solution? The answer could come from a tiny sap-sucking insect called a psyllid. They’re only 2mm long but the newly-hatched creatures drain the life out of the weed, depleting it to such an extent that it never reaches its usual mighty 4 metre height. Hundreds of thousands of psyllids have been released into the wild at eight secret sites across England and Wales over the past four years, as part of Europe’s first ever biological control trial to combat the plant. If the results bear out the early signs, the insects could represent a critical weapon in the ongoing global war against the dreaded weed. And it could open the door to more biological controls against other invasive weeds that are rampaging their way across Europe and beyond. The psyllid is called Aphalara itadori, which lays its eggs on knotweed. The nymphs eat the plants, preventing them getting any taller, and the rhizomes begin shrinking within a year. With just a year left to go in the five year trial, the signs looking very good indeed. And because most of Britain’s knotweed is genetically identical, cloned from the 1840s original, it’s highly unlikely the plants will develop immunity to the psyllid’s ravages. The scientists involved hope that the insects will eventually establish themselves across the nation and while they probably won’t eradicate the invader completely, it might slow the spread. Better still, the damage they cause might enable native plants to start fighting back. If the day comes, it’ll mean Japanese knotweed treatment is no longer such a big issue, and finding a patch of it on your land won’t be such a nightmare. In the meantime if you need help getting rid of it we’re your local Japanese knotweed specialists.